2017 was an exciting year for Animana and we worked very hard to help you care more for your patients and staff. 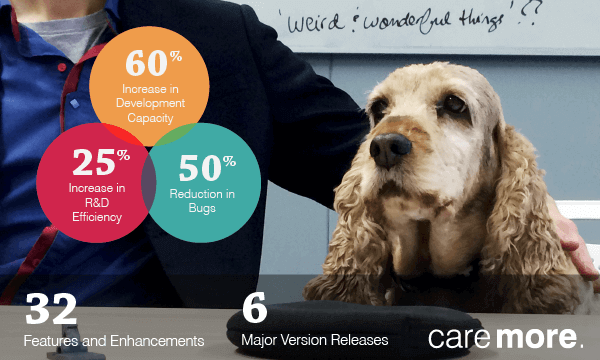 To accelerate development, we grew our R&D team by 60% and we reduced the number of bugs by 50%. Our six new major software releases included brand new features, like batch statements and autocomplete fields, and you might have been one of the people that helped us make them, as we consulted with about 50 of our customers for feedback on the design. To ensure you have the answers that you need at the right time, we grew our Customer Support team by 25%, added 127 new and updated articles to the Knowledge Base, and delivered over 1700 hours of training. Want to know more about all the progress we made last year and how we’ve laid the groundwork for a fantastic 2018? You can see for yourself with the infographic below.